As necessity is the mother of invention, decades of leaking roofs, failing mechanical systems, poor indoor air quality and runaway energy consumption gave rise to a series of comprehensive renovations. Not only did updates include new building systems, but also corrected academic deficiencies and repurposed existing spaces to create a welcoming and energy-efficient campus that serves 21st century education to a diverse community of student and adult users. This project is an example of what can be achieved with civic commitment and strong community support. The revitalization of CRLS represents an ongoing commitment to modernize our educational facilities, to promote the highest levels of learning and achievement for all students, and to reduce our community’s carbon footprint. The Cambridge Rindge and Latin School serves 1,800 students in multiple buildings and regularly hosts community and public events. The high school is comprised of the Rindge and Arts academic buildings and the War Memorial, a school and community recreation center. It also shares its urban block with two important civic uses—the Main Public Library, and Joan Lorentz Park. The renovated high school complex has been fully embraced, by students and faculty alike resulting in a great rebirth of school pride. The renovation of the 1930 and 1977 vintage Rindge and Arts academic buildings was launched initially to address failing roofs, poorly operating mechanical systems, and inadequate life safety and accessibility systems. Because these upgrades would be expensive, extensive and intrusive, the city recognized this as a one-time opportunity to address a host of other longstanding programmatic and building deficiencies. Science, visual and performing arts, food service, and administrative spaces were redefined, repurposed and relocated to better serve the school’s innovative and successful academic mission. This resulting comprehensive rehabilitation is a clear statement of the city’s commitment to both its public schools and its carbon-reduction goals. 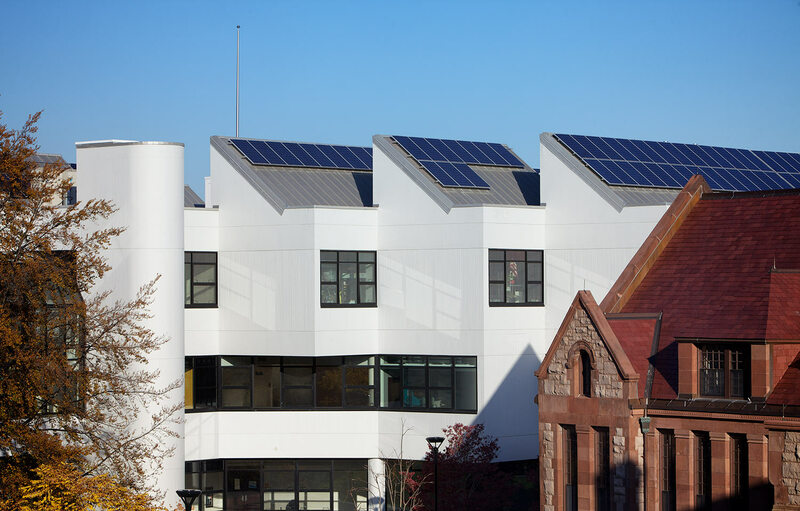 Ultra high efficiency MEP systems such as condensing boilers, chilled beams, ultra low water fixtures, a 30Kw PV array and co-generation, as well as extensive sustainable materials earned the school LEED Gold certification—one of only ten high schools in the nation at that time. The War Memorial Recreation Center is a renovation of 107,700 sf, two-story facility with three pools, a gymnasium, fitness center, field house, multipurpose rooms, tennis courts and below-grade parking. War Memorial serves 1,900 students daily and functions as Cambridge’s public athletic and recreation facility. After more than a half century of hard use, the major goal of renovation in this 1954 Art Deco structure was to better serve its student and adult users with separate entrances, easily understood interior circulation, and multi-use spaces for students, athletic teams and the community. New daylighting, colorful wall tile patterned terrazzo floors and restoration of the Art deco interiors all contribute to the building’s welcoming energy, visual appeal, durability, and LEED Silver sustainability.